The first edition was 289 pages. The second was 765 pages. 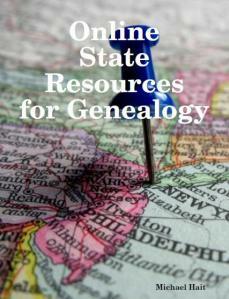 Now, the third, even more expansive version of Online State Resources for Genealogy — 1117 pages of resources — is available from its author, Michael Hait, CG. Michael is a friend and a colleague and he sent me a review copy free. But he didn’t need to do that. I’d have bought my own anyway — at $19.95, this is a steal, and the perfect gift for all of us who think that the best way to spend a day is sitting at home, in front of our computers, chasing our ancestors through the records — all without ever having to change into grown-up clothes. The emergence of the Internet has led to many online resources for genealogical research. Subscription genealogy websites, such as Ancestry, Footnote, GenealogyBank, and others, have grown to fill the market for record indexes and images online. Free genealogy sites, such as Find-A-Grave and the U. S. GenWeb Project, have employed the work of tireless volunteers over the years to provide record transcriptions and images online at no cost. FamilySearch, a product of the Family History Library in Salt Lake City, aspires to combine the best of both, providing a growing record indexes and images online at no cost. None of these sites will be examined in this book. This third edition includes many more of these off-the-beaten track resources while still providing a good overview of the mainstream archives and repositories. Here’s an example: new to the third edition is a list of National and Federal resources and, as you’d expect, there are many resources of the National Archives and the Library of Congress listed. But the other resources listed may not be what you’d expect at all. You’ll find resources of the U.S. Department of Transportation, and the U.S. Military Academy Library’s Digital Collections. The guide is probably most useful for those of us who are approaching a research task in a state we’re not familiar with. But the chances are pretty good that even old hands will find a previously-unknown resource or two even in our own backyards since the scope of this guide is very different from the usual online resources. With more than 1100 pages, the guide includes an amazing array of resources and I can’t imagine anyone picking up a copy of this guide and not finding useful resources you hadn’t heard of before. Want to browse through hundreds of thousands of Oklahoma newspaper pages dating from the 1840s to the 1920s? There’s a link to the Gateway to Oklahoma History at the Oklahoma Historical Society. Want to see who enlisted in the military in Montana from 1890 through the Second World War? There are digital collections at the Montana Memory Project. How about a database of slaves and slaveholders from life insurance policies issued on slaves across the country? The link to the Slavery Era Insurance Registry at the California Department of Insurance will take you there. There’s so much more. War of 1812 resources from Delaware. Guides to muster rolls of the Indiana militia in the Battle of Tippecanoe. Civil War diaries and letters from Iowa. Medal of Honor winners from Ohio. Oral histories from Illinois. Marriage contracts from St. Louis between 1764 and 1854. A collection of digital images showing Baltimore’s development from 1752 to 1930. Digital maps and photos of Milwaukee neighborhoods. Perhaps the single best part of the book is the listing of university libraries with online archives. They’re simply among the best — and least known, least used — genealogical resources in the country. It obviously doesn’t include every online repository, but if you know of some you think should be in version 4, there’s an email address at the front for your suggestions. And an email address for any corrections as well. The table of contents serves as an entry way into the guide — you can click on any entry and it’ll take you directly to that page — or you can search the entire guide using the search function. You will need a PDF reader — there are several free ones available online if you don’t already have one. All in all, the guide is a good solid reference work, perhaps the best you’ll find for lesser known resources, and reasonably priced at $19.95. You can order Online State Resources for Genealogy from Michael’s website at Hait Family Research. It’s a digital stocking stuffer any genealogist would love to have.